The Under 7’s played at home against Hartlepool Youth. In the first game they manged to level the score 2-2 after going 2-0 down with goals from Ashton and Kai, unfortunately conceding again whilst chasing the winner. Harrison was fantastic in goal with two saves that needed to be seen to be believed. The second game saw the high quality continue and two goals each from Josh and Harrison as well as keepers in both halves, Lennon and Ethan, being in fine form saw them through to win this one. The visiting manager awarded Harry and Roman men of the match awards. The Under 8’s were also at home facing Barnard Castle they were on fine form. Harvey, Jayden and Rhys scored in the first half. In the second half they were exceptional and Rhys completed a double hat trick, Harvey with two more, for his hat trick, and Jayden adding his second in a comprehensive win. Conor stayed solid in defence and Lucas did well in goal. On to the next game and another bright start saw goals from Jack and Niall (2) giving another 3-0 half time lead. Barnard Castle came back in to the game before Jack finished his hat trick with Aidan and Jake also scoring in another good win. Men of the match were Harvey and Jack. The Under 9’s travelled to face top of the league Spraire Lads. They fell behind early but dug in for the rest of the first half to reach half time only one goal down. The home team scored again in the second half but Cody remained solid in defence with Jude pulling off the saves to keep the score at 2-0. Reece was the games man of the match. The Under 10’s TJFA league side put in a great effort to get their game on with the parents cutting the grass and marking the pitch on Saturday so all was ready for the Sunday morning visit of Norton and Stockton. The home team dominated the game and created chances on goal right from the start. They opened up a 2-0 half time lead with goals from Charlie and then Lucas, who finished after Jacob’s shot rebounded in to his path. The second half was much the same with Aycliffe on top after Thomas had made a great fingertip save to deny the visitors. Lucas and Charlie both scored again before Jake and Evan added one each in a 6-0 win. 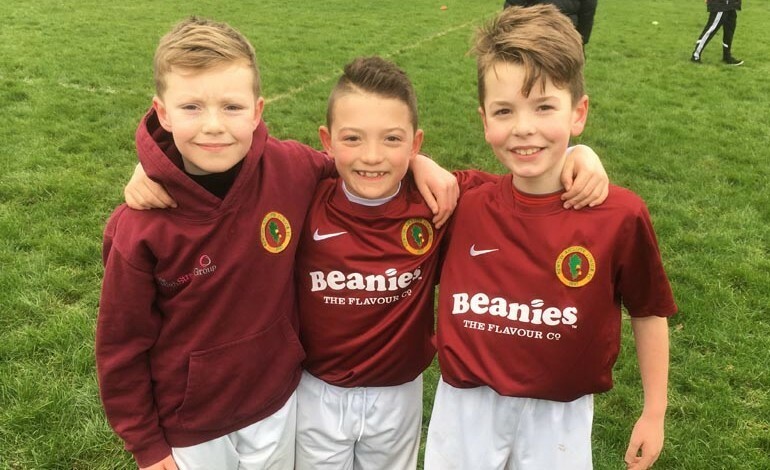 The Under 10 Russell Foster League side had no scheduled fixture this weekend. The Under 12’s played their first match since early November at home against Shildon. In the opening exchanges Adam was brought down in the box and Zack scored the penalty for an early lead. The second goal followed when Jermaine scored to bring the half time score to 2-0. The lack of regular games seem to affect the team as they faded in the second half and Shildon got back on terms at 2-2 with well taken goals. Zack was named man of the match and Harry was noted to have enjoyed a great game by the visiting manager. The Under 14’s went down 4-1 facing Cargo Fleet at home whilst the Under 18’s played out their inter club derby Reds v Blacks. The Blacks took the bragging rights with a 3-1 win, the Reds goal was scored by Jack Mitchell and their man of the match was Morghan Claydon. The Blacks awarded their whole team as men of the match due to a fine all round performance, Dragan, Craggs and Scotty provided their goals.